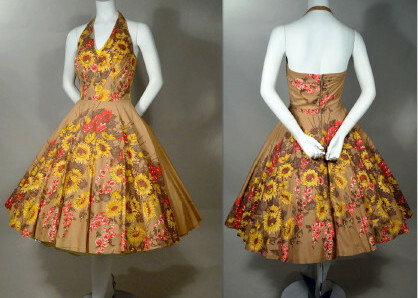 Brilliant sunflower print 50's vintage halter dress with full circle skirt. Golden brown with gold, red and dark brown print cotton and solid gold cotton. Fitted, boned bodice with V shape fashioned by center seam and darts. Deep V neck with button (self) back strap. Contrasting built-in boned peek-a-boo bra shows slightly above neckline. Full circle skirt. Center back metal zipper closure. Applied glitter outlines flowers at front bodice and skirt. Skirt length, measured back from waist seam to hem edge - 25 1/2"
EXCELLENT condition. Shows only some light wear throughout and minor wear at strap. Reinforcement repairs at skirt, seen only from underside and serve to extend life of dress. Totally wearable... lotza fun left!